The Maldives is a country like no other, a Shangri-la of breathtakingly beautiful turquoise reefs, beaches, and palm trees, it is composed of 1200 coral islands off of the Indian sub- continent, of which 200 are inhabited. But this country is in danger of disappearing and it is up to one man to save it: President Mohamed Nasheed. The Island President is the thought-provoking feature documentary from Jon Shenk that tells the story of the remarkable Nasheed, a man who made it his mission to make the Maldives the first carbon neutral country, a man who led a twenty-year pro-democracy movement against the brutal regime of Maumoon Abdul Gayoom, a man who survived repeated imprisonments and torture and became president at the age of 41. The film captures Nasheed's first year of office, culminating in his trip to the Copenhagen Climate Summit in 2009, where the film provides a rare glimpse of the political horse-trading that goes on at such a top-level global assembly. Nasheed is unusually candid about revealing his strategies – leveraging the Maldives' underdog position as a tiny country, harnessing the power of media, and overcoming deadlocks through an appeal to unity with other developing nations. When hope fades for a written accord to be signed, Nasheed makes a stirring speech which salvages an agreement. Despite the modest size of his country, Mohamed Nasheed has become one of the leading international voices for urgent action on climate change. 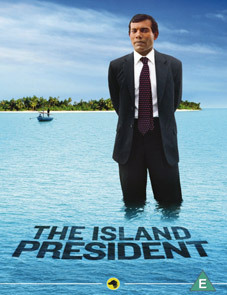 Described by Little White Lies as "environmental filmmaking at its best" and featuring a stirring soundtrack from Radiohead, The Island President will be released on UK DVD on 20th August 2012 by Dogwoof at the RRP of £14.99. Commonwealth Club Screening – post screening Q&A.